In the World Library of Psychologists series, international experts present career-long collections of what they judge to be their finest pieces—extracts from books, key articles, salient research findings, and their major practical theoretical contributions. 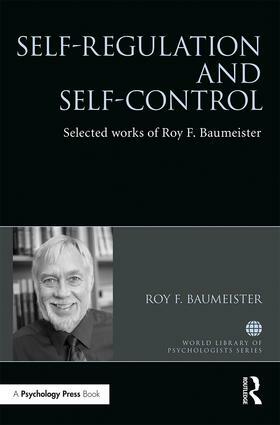 In this volume, Roy F. Baumeister reflects on his distinguished career as an eminent scholar in the field of self-control and self-regulation, as well as belonging, rejection, free will, and consciousness. Offering a unique perspective on both the program of research in ego-depletion as one of social psychology’s most widely successful theories, and its position in the changing landscape of the scientific field, the book charts Baumeister’s development as one of the pioneers of study into self-control. Featuring a newly written introductory piece in which the author offers a unique insight into the initial findings that led to an eventual theory of ego-depletion, this collection will give readers a vital understanding of how the hugely influential theory of ego depletion first came to be developed, and is essential reading for students and researchers in self-control and self-regulation. Making choices impairs subsequent self-control: a limited-resource account of decision making, self-regulation, and active initiative. Strength model of self-regulation as limited resource: assessment, controversies, update. The physiology of willpower: linking blood glucose to self-control. High self-control predicts good adjustment, less pathology, better grades, and interpersonal success. Taking stock of self control: a meta-analysis of how trait self-control relates to a wide range of behaviors. Emotional distress regulation takes precedence over impulse control: if you feel bad, do it! Longitudinal study of procrastination, performance, stress, and health: the costs and benefits of dawdling. Intellectual performance and ego depletion: role of the self in logical reasoning and other information processing. How leaders self-regulate their task performance: evidence that power promotes diligence, depletion, and disdain. Roy F. Baumeister is Francis Eppes Eminent Scholar and Professor of Psychology at Florida State University, US, and Professor of Psychology at the University of Queensland, Australia. In 2013, he received the highest award given by the Association for Psychological Science, the William James Fellow award, in recognition of his lifetime achievements. His work has been covered or quoted in the New York Times, Washington Post, Wall Street Journal, Los Angeles Times, The Economist, Newsweek, TIME, Psychology Today, Self, Men’s Health, Businessweek, and many others.